For GPs, the HFVC provides a dynamic learning environment, improved knowledge base, peer to peer support and most importantly the necessary supports to maintain and treat heart failure patients in the primary care setting. 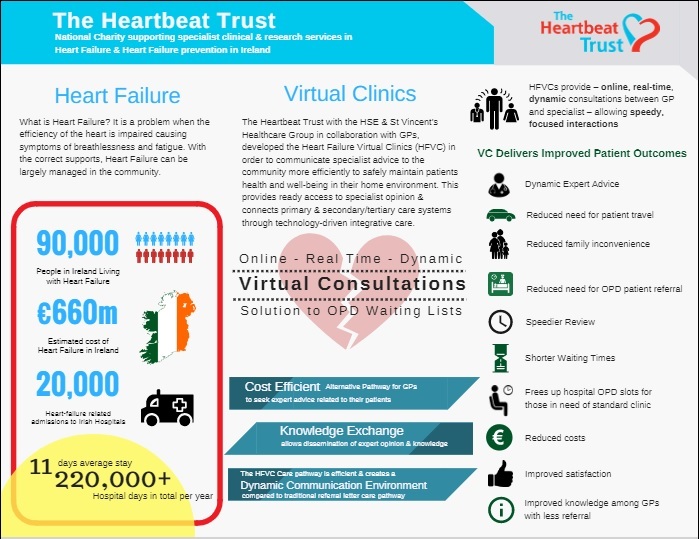 The Heartbeat Trust has been at the forefront of development of structured care programmes for the prevention and management of heart failure, including a “virtual consultation” service to enable specialists and GPs to discuss cases and reduce the need for outpatient department referral by 80%. The Heart Failure Virtual Clinics (HFVC) are used to disseminate expert advice and education to GPs. Using a web conference platform GPs can log in remotely, following presentation of a short CME topic GPs can discuss their cases with Consultant Cardiologists and their specialist team. The HFVCs provide online, real-time conversations between the GP and specialist allowing speedy focused interactions. By managing heart failure in the community, the HFVC removes a step in the traditional care pathway facilitating interaction between the specialist/GP. The HFVC care pathway is cost efficient and creates a dynamic, collaborative communication environment compared to the traditional referral letter pathway. This in turn reduces costs and reduces the need for patient travel and family inconvenience. Moreover, the HFVC reduces the need for Out Patient Department (OPD) referrals which frees up hospital OPD slots for those in need of standard clinics resulting in shorter waiting times and speedier reviews. The Heartbeat Trust are passionate about the future advancement of eHealth in Ireland and are optimistic about the use of technology for wider dissemination of heart failure knowledge and community care. The Clinic has been successfully running for twenty-four months. These virtual consultations are held bi-weekly from the Heartbeat Trust Head Office on Tuesdays and Fridays at 1pm, having recently expanded into the Carlow Kilkenny region through support from the HSE. CME topics include (but are not limited to), Diagnosis of Heart Failure, Management of Stable Heart Failure, Troubleshooting medications in heart failure and other similar topics. Following the CME topic up to six cases are discussed which results in an intense hour of impartation of knowledge. Patient referrals are accepted through email/FAX and Healthlink, via the Heart Failure Virtual Clinic Referral tab. Presently, there are 150 GPs signed up to date across the East Coast, Midlands and now Carlow Kilkenny region with 100% of GPs agreeing that the HFVC advice was useful in treating their patients and that the patients themselves benefited as a result of their participation in the HFVC. The patients themselves were also happy to have their conditions discussed with expert and groups of GPs and relieved to not be referred to the OPD. The Heartbeat Trust provide full training for first time users or those that require a refresher. St. Vincent’s University Hospital provides a front line emergency service and national/regional medical care at inpatient and out patient levels with in excess of forty medical and surgical specialties. The hospital has 554 in-patient beds, incorporating 7-day, 5-day and day care options, including intensive care, high dependency and coronary care beds as well as medical, surgical, orthopaedic, care of the elderly and psychiatry beds. Strong links and co-operative agreements have been established with other healthcare providers at primary and secondary care levels in the South East Region of the Eastern Regional Health Authority. These links have been established to improve patient care and access to specialist services. St. Michael’s Hospital has 134 in-patient beds incorporating 7-day, 5-day and day care options. Facilities are provided for acute medical and surgical patients, out patient clinics and an enhanced 8am – 8pm accident and emergency service. A range of general and specialist services, which include a Cardiac Rehabilitation Programme are also provided. St. Michael’s is the regional training centre for Pulmonary Rehabilitation Care and a Diploma course for Pre-registration/degree students is delivered in association with the College of Surgeons and University College Dublin. 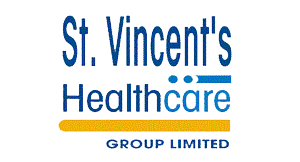 St Vincent’s Healthcare Group, (incorporating St Vincent’s University Hospital, St Vincent’s Private Hospital and St Michael’s Hospital) provides acute general medical care serving the South East region of Dublin and surrounding areas. The company is a not for profit, voluntary group of hospitals, has charitable status and it’s shareholders are the Sisters of Charity. 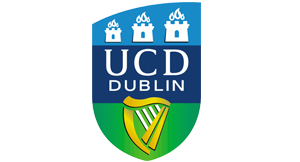 University College Dublin is an Academic and Research University in Dublin, Ireland. It has over 1,482 faculty and 32,000 students, and it is Ireland’s largest university.